Wizards are real - and you can become one. The world needs more wizards - human beings who have gained an unusual level of wisdom through experience and reflection, and who act more powerfully and effectively than the average person does. They instigate and help smooth the way for change. They accept responsibility. The rate of change in our world is accelerating. We have reached turning points in many areas, and the fate of our planet may well hang in the balance. We need more and more wise and powerful wizards to help guide us on toward the ever-evolving, exciting future humanity is capable of - and away from the complacent, ineffective, and wasteful ways that threaten our very existence. Whether you seek to become a real wizard in order to help transform yourself, your business, or other aspects of your world, I hope you'll take up the challenge. 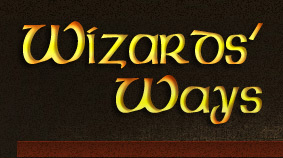 The way of wizards is filled with excitement, power...and rewards of many kinds! Tobias Beckwith, author of Wizards' Ways, is the prime mover for this effort to create the wiser, more powerful and responsible human beings we call wizards. He has had a long career in live entertainment, including a stint on the faculty at the University of Pittsburgh, followed by a long period working in the theater on and off-Broadway, and then over 20 years creating shows and nurturing the careers of some of the world's top magicians. His deep fascination with the magical workings of the human mind led to studies in neuro-psychology, shamanic practice, kriya yoga and other "secret" practices for human development. Setting out to share some of the secrets of performers, yogis and others a few years ago, the idea for Wizards Ways was born. Wizards not only believe, but DO impossible things. So can you.